Wow, the finale to Season 3 was astonishing. I don't watch this show, which I hear is all kinds of awesome. I'm just dropping in to this forum to plug my friends Ensley & Dale Guffey's forthcoming book about it, Wanna Cook? The Unofficial Guide to Breaking Bad, from ECW Press, 2013. Dale is the author of Faith & Choice in the Works of Joss Whedon (as K. Dale Koontz), and both she and Ensley have published essays on Whedon's Buffy, Firefly, & Dollhouse. Dale teaches communication & media studies, Ensley studies classics & military history. They're good writers AND they're two of the best people in the world, so put their book on your list if you're a fan of Breaking Bad. I think I just watched season 5. The only weird thing is that Ryan Gosling was playing Jesse. 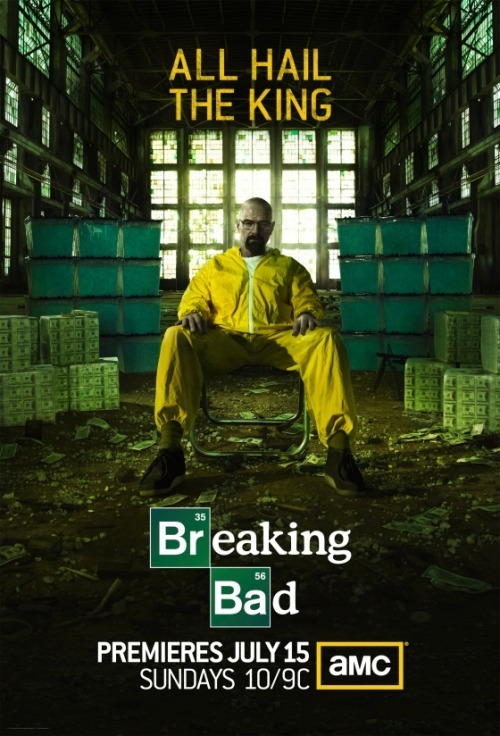 Talk about the wages of sin: this show just fascinates me as we see Walter's rationalizations, self-deception, and ugly behavior build and build, such that he progressively and believably moves away from the highly sympathetic character we saw at the beginning of Season 1. It amazes me, too, how convincingly and insightfully we see the ripple effect of his choices on every major and minor relationship in his orbit. I always loved this comment. I am watching this again because my wife decided to dive in. In hindsight, the signs were there that Walt was a real piece of work from day one. The lying. The arrogance (oh, the arrogance). It's all there from the beginning. In hindsight, the signs were there that Walt was a real piece of work from day one. This is a show I'll be rewatching, so I'll need to see to what you're referring. I recall a significant amount of envy towards his brother-in-law from the beginning, though. Bryan Cranston says the show will return in July. huge ordeal where Gus Fring was forced to meet his maker. It’s not as easy as Walter thought. And as we’ve discovered over the years, you don’t really know who Walter White is. Breaking Bad going dark isn't exactly a surprise, but it's interesting to hear Cranston's angle on it. Season five will premiere Sunday, July 15th. Bryan Cranston discussed the possibility of a Breaking Bad movie with the LA Times. But when we spoke to Cranston recently, he revealed that the narrative pendulum had now swung in the opposite direction. Which leads Cranston to considering his character’s future beyond the next 16 hours of television. He also talks about the end of last season/beginning of this one at the end of the story, so skip that if you haven't caught up all the way. Walt's Climb to Sociopathy infographic. Not posting it here because of spoilers if you're not caught up on the series. It's a nice refresher for the new season if you are, though. Slate has this little piece for chumps like me who've tried to prepare for tonight. I've crammed close to 40 episodes into my viewing schedule over the past two weeks, and have loved every minute of it. Breaking Bad is now Mythbusters. I have been rewatching the first few seasons, as I have not seen them since they aired. Whether intentional or not, I am amazed at how much foreshadowing we see in the first season alone. Even the first episode contains most of the elements we see in the later-Walt. I am not sure what the process was here, but the writers either went back to earlier episodes for images and plot devices to embed in later episodes - or they planned some of these out from the beginning. The latter does not seem to be the case, because I recall a lot of interviews talking about how they were still feeling their way through the last two seasons as they developed. And we almost lost the show due to ratings in... Season 3? (An aside - there was a Slate article about watching things as they air rather than "binge-watching." It is so inane that I am surprised Slate actually ran it. NPR did a follow-up this weekend during which the host very graciously did not eviscerate the writer, which would have been easy to do. Binge-watching Breaking Bad is an excellent way to watch the show. I am picking up more details about Walt's character development than I did the first time around. The first time around was like getting a weekly dose of shock and awe that took 6 days to wear off). See Greg's post above, Mike. About the article, as inane as it is, I think there's some value to taking your time with a show. Binge-watching helps with details (which is why I do it), but I try to limit my daily intake to, say, three episodes, tops. Helps connect the pieces, but also gives things time to simmer a bit. On one hand, I'm ashamed to be such a johnny-come-lately , but binge-watching and digesting four years worth of story-telling in two weeks has actually been one of the most savory treats I've ever experienced with a series. Kinda sad I'm all caught up now and this is the end. Any opinions on the S5 premiere? As a spoiled Netflix viewer, I was a little aggravated by all the commercials but I was also wondering-- does AMC edit the show's profanity and other graphic content? Netflix viewing was definitely R-rated fare and it seemed that Sunday's show was pretty tame. There was a very good article in The LA Review of Books speaking of the Old Testament moral universe of Breaking Bad. Also, Hank's expression when his sergeant (I think?) talked about what was going on right under his nose was great. Yes. I get the impression he's starting to get an inkling that something similar might be happening to him, no? I don't see how they can plausibly stretch out Hank's ignorance of Walt's life much longer. I'm hoping that they get it out of the way soon and don't try to hold off till the very end of the season. Hank has consistently demonstrated an incredible knack for detail and following through on hunches-- holding off too long on the obvious could sour an otherwise amazing arch. "everyone dies" in Scarface line a little too obvious? Tyler, given the opening of this season, I also felt that was a bit heavy-handed. But maybe it is misdirection. My whole TV drama experience is so shaped by The Wire, that it was a bit stunning be reminded this week that everything we have seen in the first four seasons plus happenned in less than a year. The open of the first episode this season, of course, noted the two-year mark, but that is further off in the narrative than I expected.